In a large bowl, mix flour, cream of tartar, baking soda, cinnamon, and sugar. Mix the water, milk powder, and eggs in medium bowl, and blend into the flour mixture until smooth. Fold in the apples. Ladle batter into the preheated waffle iron. 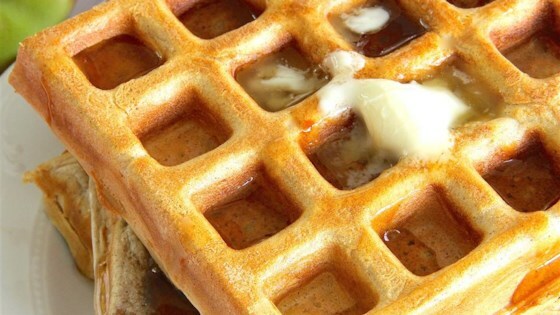 Cook waffles until golden brown. We have reviewed this recipe for errors based on the complaints, and have changed the amount of eggs from 3 to 2 as per the original submission. They turned out great! The kids loved them! after reading the reviews I added 2 tsp baking powder, omitted 1 Apple and added applesauce, vanilla and omitted dry milk and water and added whole milk instead. My family loved it!